On the whole i’m pretty relaxed about differences in what is now known as “English” and “International English”. In fact after reading Bill Bryson’s Mother Tongue i’m even willing to accept that North Americans probably now hold the baton for my first language. There are, however, one or two small and very unimportant words which somehow do press the wrong buttons. In particular there is the name of the ‘#’ character. It’s a ‘hash’, ‘number sign’, ‘square’, ‘sharpe’, ‘scratch’, ‘cross-hatch’, ‘gate’, ‘thud’, ‘thump’, ‘pigpen’, ‘grid’, ‘flash’ or even an ‘octothorpe’. 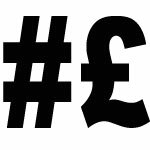 It is patently not a ‘pound’ as ‘£’ is a pound! A Whatfettle article by Paul Downey published Saturday, March 13th, 2004, at 5:14 pm under a Creative Commons License.